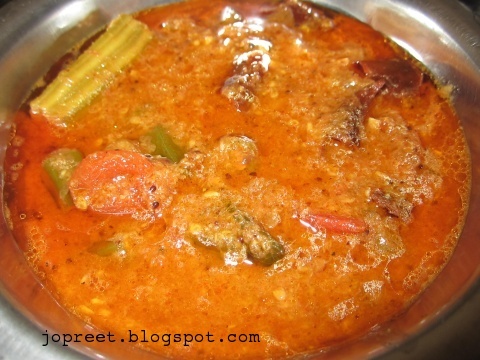 Heat oil in a kadhai or pan and temper mustard seeds. Add fenugreek seeds, urad dal, broken red chilies, curry leaves and saute a while. Add chopped onions and garlic flakes. Fry till it turns golden brown. Add chopped tomatoes and mash it well. Add chopped vegetables, turmeric powder, red chili powder and coriander powder. Cook for few minutes. Add coconut paste, tamarind water and salt to taste. Cook it covered till the gravy becomes thick and oil separates. 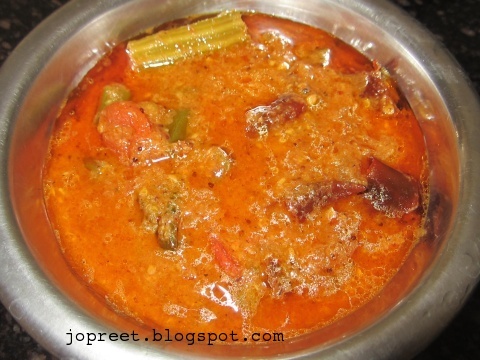 Serve hot with steamed rice and vathal. very flavourful and tangy curry..
Lovely colour and tangy curry. Got attracted by the name of the dish..looks delicious!